This audiobook has two phrases emblazoned on the cover: “Special Blackstone Collector’s Edition Audiobook” and “The Greatest Horror Story of All Time! !” (both exclamation points are there…) Of the first phrase I can say that this audiobook is certainly special. 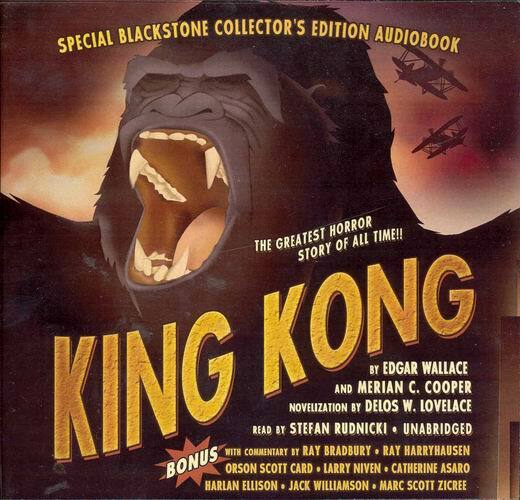 Not only does it include the unabridged audio version of the novelization of the original King Kong film, but it also includes a bonus disc containing commentary from Ray Bradbury, Ray Harryhausen, Orson Scott Card, Larry Niven, Catherine Asaro, Harlan Ellison, Jack Williamson, and Marc Scott Zicree. Is it the greatest horror story of all time? Not in my eyes, but the words fit nicely on this gorgeously packaged audiobook. The original King Kong film (1933) holds a special place in a lot of hearts. I don’t share those feelings, possibly because the film predates me by 35 years. I recall more details about the 1976 remake starring Jessica Lange than I do the original. I was 10 in 1976 and, since that version of King Kong was mediocre, it stirred little in me. News of Peter Jackson’s remake didn’t excite me. But this audiobook has awakened my interest in a big way, for two reasons. First, the story itself. Engagingly read by Stefan Rudnicki, the story of Kong, Denham, Ann Darrow, and Jack Driscoll is really a good story. The filmmaker Denham’s recklessness, actress Ann Darrow’s willingness to go along, and Jack Driscoll’s love keep things very interesting. Kong, of course, is the character around which the story revolves, and his journey from island to New York City and from beast to human-like ape fascinates. The second thing that sparked my interest is the commentary. I loved the commentary included here. All of the people I mentioned above had a different and interesting take on King Kong, from Harlan Ellison’s declaration of the original film’s perfection to Catherine Asaro’s discussion of power unused. After listening to this, I’m now eager to see the new film, and even more eager to watch the original. It would be an excellent thing if other books are given similar treatment. Unabridged classic science fiction novels with commentary would add a new and greatly appreciated dimension to the audiobook experience. Kudos to Blackstone for giving us this Special Edition.